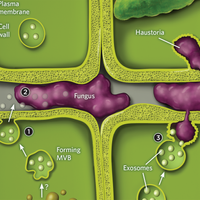 Clathrin-mediated endocytosis (CME)—by which cells ingest extracellular molecules and internalize cell surface proteins—is an essential process in practically all cells. Now, Volker Haucke of Freie Universität in Berlin and colleagues have identified two small molecules, which they named “pitstops” 1 and 2, that bind to clathrin’s terminal domain and stop CME. The inhibitors not only will help researchers elucidate clathrin’s molecular mechanisms, but could also serve as the basis for designing CME-preventing drugs for a variety of clinical applications. Haucke and his team found the two compounds after screening 17,000 small molecules for ones that could interfere with the protein-binding ability of clathrin’s terminal domain—thought to be an important interaction site. The molecules were named pitstops 1 and 2 because, early in endocytosis, the plasma membrane folds inward and becomes sheathed in a clathrin lattice, forming what’s called a clathrin-coated pit. As the pit grows, more clathrin accumulates, coating the entire spherical structure. 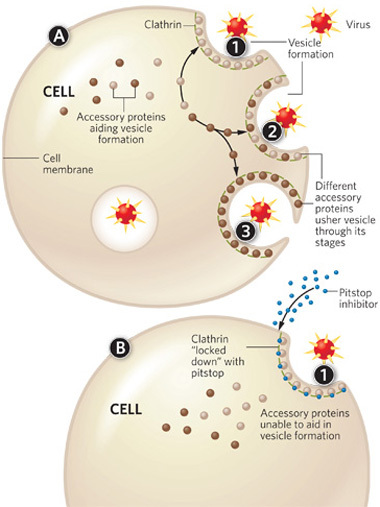 Pitstops 1 and 2 do not prevent clathrin’s recruitment, but rather the dynamic cycling of various accessory proteins that each drive a different stage of endocytosis. The inability of the accessory proteins to bind clathrin, therefore, brings endocytosis to a standstill. While both pitstops 1 and 2 bind and inhibit clathrin in a similar way, only pitstop 2 is able to efficiently cross cell membranes. The team therefore used this molecule to see whether they could interrupt certain cellular processes requiring CME. Pitstop 2, they found, could halt HIV entry into cells, and could prevent the recycling of synaptic vesicles in neurons. Both the release of neurotransmitters and the internalization of neurotransmitter receptors on receiving neurons are mediated by clathrin-coated vesicles. Interfering with vesicle dynamics could thus modulate nerve cell transmission. The paper L. von Kleist et al., “Role of the clathrin terminal domain in regulating coated pit dynamics revealed by small molecule inhibition,” Cell, 146:471-84, 2011.